The Europeans, and especially the British, have been waiting upon and fearing the so-called Beast From The East, which was due to hit the islands and then the mainland a while ago and, due to form did, with all the feared bad weather such a Beast brings. This is the first time I have heard such terminology, heard a bad weather front, as they were always called, being played up into an assault upon coastal and inland areas in such a fashion. In the past there have always been names fort these storms – I believe this one was also called Emma, but I’m not too sure about that, although it would be appropriate – with male names also being used in the last few years, alternating with the female names. Appropriate to have a storm name such as Emma? Certainly, because this storm, if it did indeed have that name, has come at the same time as a young woman in Florida begins, with her school colleagues, to challenge the backward thinking of those who place guns above the lives and safety of children, and she, it would appear, is a storm that will not be fading out either from real action or from memory too soon. In England, apparently, the Beast From The East has brought deep snow as well as freezing weather, but not right across the country. Yesterday I saw someone blessing a few snowflakes falling from the sky in Bloomsbury, London, right outside the British Library, although someone else pointed out that there were queues in the stores as people panic-shopped in case a second snowflake should fall. At least, that is the impression one has: panic shopping at the slightest hint that there could be bad weather even though, unlike in some parts of the world, the chances of us running out of provisions are small, remote in the extreme. Our stores are so full there is barely room to move, and the wastage from overstocked items doesn’t bear thinking about. Here in Germany we find that the special kitchens set up for the needy – those who are on welfare payments and have a hard time getting enough together to meet their daily needs – are well stocked and amply supplied because of this over stocking of the shelves in food stores. Some people suggest, and I feel that this is the wrong attitude, that being on welfare is a better position to occupy than having to pay for your food: you still get what everyone else has, just two days later. It is possible, I am told, to live the life of a member of the royal family through such handouts, but I tend to give such thoughts a wide berth. I have been in this situation myself – admittedly many years ago – and know that it is not quite as some people wish to make us believe. Here we have had next to nothing of snow, let alone snow drifts and the prospect of having to dig ourselves out. I have been forced to watch videos of other people’s dogs fighting through the white masses, or being dropped into a drift and disappearing momentarily from sight. A few snowflakes have fallen here, over many weeks, but all we have really had so far is a very cold wind, freezing temperatures and wonderfully clear blue skies. The worst night we hit minus eleven degrees centigrade, and that was it, hardly worth writing home about, as we say, and quite usual for the middle of winter, even if many people no longer see March as being in the winter time. What they fail to see, however, is what some have been saying for many years now: climate change means that our seasons and the weather we are used to within our own regions, is changing. In some areas it will become considerably warmer, in other colder, that is just the way of things. And those who check back through history, rather than just spout out their uneducated opinions, will notice that these changes have happened many times throughout the history of our planet, are not new, but have been helped along, speeded up, by the actions of humankind. However, I am not planning on writing a thesis on climate change, man-made problems or the acceptance of the inevitable, but merely a letter with, I hope, a few interesting events and thoughts contained within it. There are enough people out there writing, in all possible directions, about what is happening to our world, and discussion is rife, plentiful, enthralling and, at the same time, something to be scared of, depending on who you happen to listen to, so there is no need for me to join in with the general cacophony. I am merely a letter writer with a penchant for philosophy, history and, recently, dance theatre, although it is almost impossible, for those of us who are awake and constantly looking around us, not to get involved in a discussion at some time or another. Sometimes what begins as a harmless conversation about irrelevant things – the small-talk so many people are incapable of performing and fear – turns very quickly to the latest intrigues and conflicts in our society or, worse, in other societies where we have no firsthand experience. Once that happens you know that the evening is lost forever, t will no longer be a pleasure, and I tend to look down into my glass, or eat my meal quickly and silently, before making my excuses and wandering off somewhere else. This is also dangerous, hasten to add, if you do not disappear far enough away: I have been caught enjoying a wonderful evening without my argumentative friends, having promised I was tired and needed to sleep, and then gone to a dance or some other interesting social function. I cannot remember a time when I have not been able to see the stars. It would have been the last time that I lived in a major city, which is going back a very long way indeed, where, as you experience, the heavens are shrouded in mystery thanks t the sheer waste of light around us. I have experienced it in major cities I’ve visited, but always had the good fortune to know I am not staying long, that I will be back in the countryside soon, the real world – for me – and able to see beyond the dome of light created by people who do not need to see as much as they believe they need to see. I recall looking out of my hotel window in Baltimore a few years ago, at about three in the morning, to see what was happening. Every single street light was on, as if it were daylight beneath me, but not a single person on the street, and the only movement was that which had disturbed my sleep: a police car driving through the centre of this deserted city, with its siren on full blast. But I do know that there are some areas on Baltimore which are not lit up like a Christmas tree at all hours of the day and night, because I visited them on my morning walk. 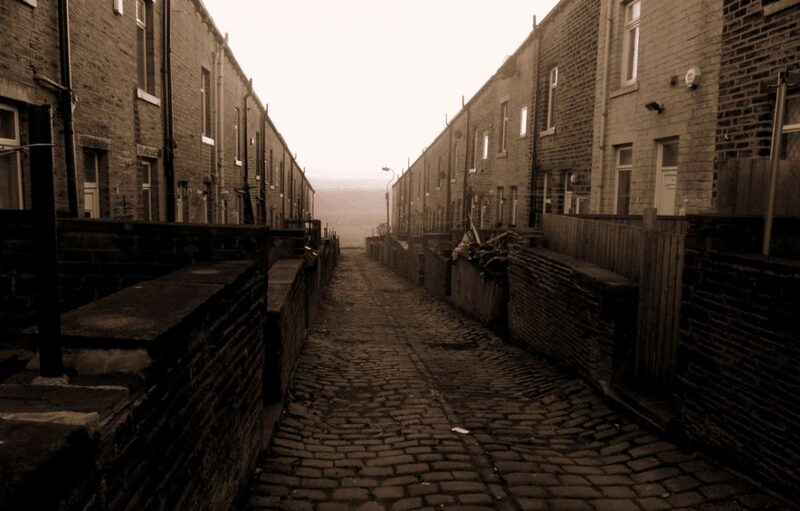 It was something of a strange feeling, going from an over-lit area into streets which had no streetlamps at all, where the houses were in terraces, grimy and closed off, small and apparently abandoned. Such places, streets of poverty and hopelessness, are not foreign to me; I have seen them the world over in countless different cities and regions. I have seen the poverty of a London area bordering on the affluence of another, as well as the beauty of a worker’s terraced house, small and insignificant, but cared for and lived in as a home. I have lived in a wooden house in the middle of the poorest parts of the city of Belize, the former slave quarters and enjoyed the time more than when I stayed in richer parts of the world. But I have also seen the mentality of the people who live in such places, and it is sometimes them who scare, and sometimes the sheer oppression of a region without a soul to be seen. A row of houses can give an impression of affluence just as much when it is abandoned of life, or appears to be so, as when a camera team goes in with the right lighting, film music and a light mist rolling across nearby fields. I have seen the arrogance of religion and of colour – in Baltimore the separation was along lines of skin colour, the poorer districts inhabited by people of colour, the better if not more affluent by those with white skin. I have also experienced the separation and hatred caused by religion, elementary schoolchildren attacked and spat on merely because of the religion of the family they were born in to, and the position of their school in Northern Ireland. Now, though, I can look out of my window in the middle of the night and, if the sky is clear, I see the heavens spread out before me, with billions of unreachable stars and, hopefully, free of all the problems humankind creates for and against itself. I mentioned dance theatre a few lines ago, and this is an expansion of my growing interest in ballet which, at my advanced age, burst into my life at the end of last year. About a week ago I had the chance to go into Bremen and attend a rehearsal of a new dance project in the Theater Bremen performed by a small dance troupe called Unusual Symptoms. This small group has been in existence, I am told, for several years, but changes some of the members each year – or at the end of each season, since seasons are not the same in the theatre as years are on our calendars! – and comprises dancers from Germany, Taiwan, Hungary, Finland and Denmark. I had the pleasure of being ushered, with about fifteen other people, into the bowels of the theatre and a very sparse and empty practice room where, balanced on the edge of an old couch, I witnessed part of the planned performance and had the opportunity to discuss and observe and give an opinion. It was a fascinating experience, and one which I hope to be able to go through again in the future. I also went to the Premier of the dance piece – called Crash – in one of the smaller stages of the theatre and saw the whole thing in its finished version. But the discussion we had during the rehearsal gave me much to think about, as other people had similar ideas to mine, but one or two were a bit confused or – as one said – overwhelmed by the amount of action, movement on the stage all at one time. The piece covers seven people involved in a car accident, and so it is fair to assume that there is a lot happening in all areas around the crashed automobile and all at the same time. Such an event is overwhelming, so the producer had it right with that point. Whether I will feel an affinity for modern dance in the same way as I d for ballet is another matter entirely. I watched the performance with completely different thoughts – different eyes, we would say – than I did any of the Bolshoi Ballet performances, and I am not too sure that any of the modern dance performances would bring out the same emotional reaction in me as, say, Romeo and Juliet did, even though I knew the ending. But it is still early days and there are many, many more performances of many, many different works planned for the future and, who knows, perhaps I will be invited to see a few of them backstage as well as from the auditorium and enjoy both the creation and the finished presentation. Not that this form of art will take me away from those arts – the humane arts, or liberal arts – which already enjoy, I am certainly not finished in that area at all, and there is certainly not a lack of new avenues to explore, to become lost in, to follow through towards the light at the end of whichever tunnel people claim is there.